All vehicles, including carpoolers, traveling on the 91 Express Lanes must properly display a FasTrak® or FasTrak® Flex® transponder linked to a valid account. Travel without a properly mounted transponder is subject to citation by the CHP and the issuance of a toll evasion violation notice. Express Accounts or One-Time-Toll payment accounts offered by the Toll Roads (State Routes 241, 261, 133 and 73) are not accepted on the 91 Express Lanes. A FasTrak® transponder issued by any of the California toll operators will work on the 91 Express Lanes. To help us provide you with excellent customer service, please affix your transponder to the inside of your windshield as illustrated below. It is a violation of the California Vehicle Code to use the 91 Express Lanes without a properly mounted transponder. If you require additional adhesive strips, please contact the 91 Express Lanes Customer Service Center at 800-600-9191. 1. Clean mounting area inside of windshield with rubbing alcohol and let dry. 2. Remove plastic tape from back of adhesive strips on FasTrak® transponder. 3. 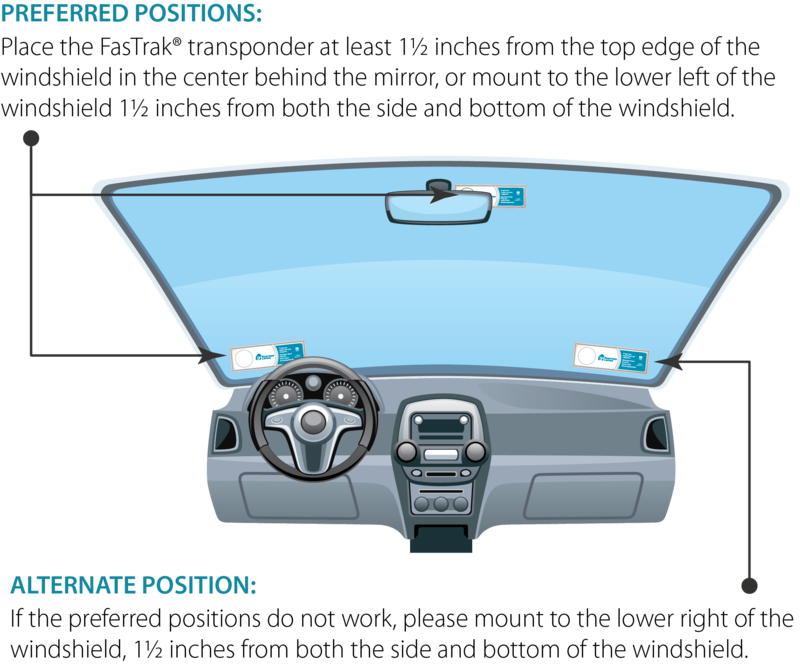 Position FasTrak® transponder as illustrated below based on your mirror type. 4. Press FasTrak® transponder firmly against glass.